First of all, what is an encoding? Let us remind ourselves that computers, however sentimental they may seem to us, in fact have no feelings in their internals but only numbers. How is it then possible that the reader sees not numbers but text, and namely text in the English language? Thanks to encodings. An encoding is a convention, a mapping table between numbers inside the computer and characters. And when we say characters we mean symbols, letters, punctuation marks, digits, ideographs, etc. There have been many encodings (at some time, each computer manufacturer had his own ones). Today the most important encoding, with strong chances to become the one and only encoding, is Unicode. This encoding has room for more than a million different symbols. In Unicode, Greek character have unfortunately (because of stupidness and ignorance of some ELOT employees) been split into two tables: the first contains the so called "Basic Greek" (in fact: monotonic one) and the second the so called "Extended Greek" (in fact: letters with accents, breathings and subscript iota). Besides the fact that polytonic Greek is by no means an "extended" one but the most ordinary one, because of the existence of these two tables, we have the completely absurd situation of having coded twice the acute accent: as tonos of the monotonic system and as oxeia of the polytonic one. On this table we see positions 0370-03FF (in hexa, that is 880-1023 in decimal numbers). Some explanations: 0391-03A9 are the capitals (with an empty position for the final sigma) and 03B1-03C9 the lowercase letters. 03AC-03AF and 03CC-03CE are vowels with acute accent, 03CA-03CB vowels with diaeresis and 0390, 03B0 vowels with diaeresis and acute accent. 03AA-03AB are capital letters with diaeresis (which, contrarily to accents, is placed also on capitals). All other accented letters can be found in the table of "extended" Greek. 0374 and 0375 are signs for Greek numerals. For this numbering system still in use today we also need stigma (03DA/O3DB), qoppa (03DE/O3DF) and sampi (03E0/03E1). 0387 is the upper dot (Greek semicolon) and 037E is the Greek question mark. The remaining punctuation marks are common to those of the Latin script and can be found in the ASCII table. 03DC/03DD is digamma and 03D7 the abreviation of word καὶ (= and). 03D8/03D9 are the archaic forms of qoppa used only in text and not for numbers. 03F3 is the hypothetic letter jot which can be found in ancient Greek grammars. Characters 03D0-03D6 and 03F0-03F1 are not used in Greek text but only in mathematical formulas. Characters 03E2-03EF belong to the Coptic script and have no relation whatsoever with modern Greek. Here we see positions 1F00-1FFF (in hexa, that is 7936-8191 in decimal numbers). We find here all vowels (and consonant rho) with accents, breathings and subscript iotas. For capitals Unicode uses the term "adscript" instead of "subscript" but the meaning is the same. It is interesting to note that even on capitals the accent belongs to the letter and together, letter and accent, form a unique character (contrarily to the typewriter, where the accent was obtained by a separate keystroke, before the letter). Often we hear the term "UTF-8". What is it? To avoid low-level technical issues which would scare away people who are not computer freaks, let us say that UTF-8 is a way of using Unicode. When we say that we "use Unicode" we mean, for example, that we agree that letter Θ is called GREEK CAPITAL LETTER THETA and can be found at position 398 of the encoding. But we don't say how this number 398 is stored inside our document. Be saying that we use UTF-8 we get more precise and give exactly that kind of information. 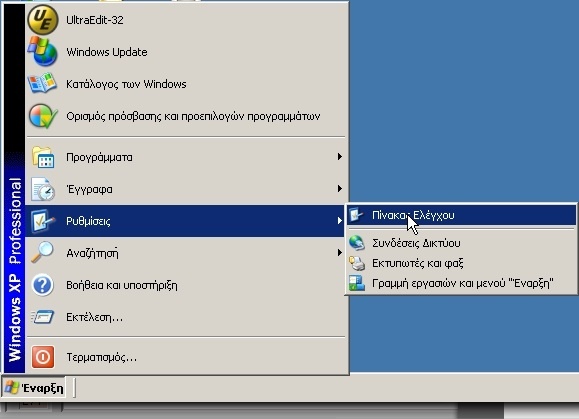 Every Unicode-compiant operating system can handle polytonic Greek efficiently. This goes for Linux, MacOS X and Windows 2000/XP. An encoding maps numbers from the computer's memory to symbols. But how do these symbols become luminous images on screen (or printed images on paper)? Via fonts. A font is a resource containing images of symbols corresponding to characters of a given encoding. To display polytonic Greek on screen or to print it on paper we need appropriate fonts. In older days, before Unicode became widespread, there were various fonts belonging to various, completely unrelated encodings. The result was chaos. Nowadays, from the moment a font is Unicode-compliant and contains Greek letters with accents and breathings, we can immediately use it in any operating system. Take a look at our page “Font Catalog” for more information on the hundreds of available fonts. We first write the contents of the Web page in UTF-8 by using one of the keyboards above. On that level there is no problem whatsoever. By this way both worlds are (more or less) happy. There is also a much more efficient solution: using the GlyphGate software on the server level. This server module will send different code to each browser so that the display is always optimal. This works for modern browsers (IE7, FireFox 1.5, Safari, etc.) but also for the older ones. Among the examples given by GlyphGate's company em2 Solutions we also find a (polytonic) Greek one. AFAWK there is no spelling checker yet for polytonic Modern Greek. One of the goals of our movement is to develop such a tool, as open source software. We want this tool to cover both dêmotikê and simple kathareuousa («ἐθεωρεῖτο» instead of «θεωροῦνταν» etc. ), and locutions («δόξα τῷ θεῷ», «ἐν πάσῃ περιπτώσει» etc.). If you wish to help on this project please contact us. These programs will automatically place accents and breathings on monotonic text and convert it to polytonic. This program by Yorgos Chrysogelos (company Data-Soft) is available in Greece and abroad eversince 1992. Its initial version was for MS-DOS but it has now been adapted to all versions of Windows and can also be used as a plug-in to Microsoft Word. It produces very good results as well in ancient as in modern Greek (kathareuousa and dêmotikê). Grave accents and subscript iotas can be de-activated. For more information, see here (The Web page is unfortunately written in monotonic Greek). This program, developed by company MAGENTA is available in Greece and abroad eversince 1998. It works as a plug-in of Microsoft Word. For more information, see here (The Web page is unfortunately written in monotonic Greek). This program is an achievement of company IDEASOFT. It is very efficient for OCR of polytonic texts, especially if these are typeset in Greek 90 or Times Greek. For more information, see here (The Web page is unfortunately written in monotonic Greek).